All content used by Pondok Edukasi is free, so users should understand and adhere to the existing policy. The information collected is "INFORMATION INTERNET NETWORK STATUS", "WIFI STATUS INFORMATION"
With regard to information security, Pondok Edukasi only uses the internet for the needs of ad serving so it does not interfere with any privacy data held by users. 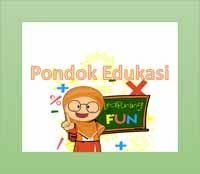 Pondok Edukasi Application is Application which is free of charge, so user must be ready with advertisement that appear on our Application.